I went to the supermarket yesterday. I quite like going to my local Woolworths. Its poorly designed car park is a nightmare, but otherwise I really like it. It only opened eighteen months ago, so it’s very modern and it’s absolutely enormous. It has a number of reasonably unique features and generally carries loads of stuff that lots of other stores don’t. And it’s almost entirely surrounded by apartments, which means most of its customers are young couples or singles. That means there’s rarely a child in site, which is just how ranty old men like it. These days it’s so easy to get in and out of most supermarkets without even having to speak to anyone, which is definitely my ideal shopping experience. I tend to pop into my local Woolies every few days or so to pick up whatever I need, as and when I need it. Even though I quite like going to the supermarket as a general rule, as a ranty old man I’ve no wish to be inside one for any longer than I absolutely need to be. As a ranty old man whose only other consideration is a cat and whose idea of cooking rarely requires anything more than a microwave, I’ve also no need of a big weekly shop. That’s a good thing, because the weekly shop was always a flawed approach for me in the past. Instead of collecting the 25 things on my list and maybe a couple of random things that I forgot I needed until I saw them, my shopping trolley would invariably end up significantly more full than intended. In turn, my bank account invariably ended up significantly more empty than intended. I eventually saw the error of my ways and now I’m a basket-only grocery shopper. When I go in with a basket and a list with ten things to get, I’ll almost always leave with only those ten things and a far more predictable post-purchase account balance. Yesterday I stopped in at a different Woolworths. Like my local, it’s quite large but this one’s inside a suburban shopping centre. It’s that awful ’90s supermarket design that makes everything seem really cramped. The ceilings are too low, the aisles are too narrow and they’re too close to the checkouts, the majority of which are almost always closed anyway, so the already minimal space is generally full of people leaning on their overflowing trolleys, waiting in queues. Almost everything about the place annoys me, but I reasoned that I was passing and it would save detouring to my local on the way home. Going into a supermarket you’re not familiar with is like some weird déjà vu / dream thing: it kind of all looks the same and you kind of feel like you’ve been there before, but nothing is quite where it should be. So I wandered up and down, back and forth, ’round and ’round looking for the six things on my iDevice shopping list. As if it wasn’t unpleasant enough that the place was heaving with people, every time I got anywhere near the front I found myself playing retail dodgeball, under attack from packs of marauding trolleys, stacked almost to the ceiling and circling skittishly, waiting to pounce on the next available service point. Seriously, they were like wild animals! Have you ever had to navigate your way through an actual minefield in the middle of an actual war zone, where all it would take is one wrong step for your life to be forfeit? Well no, neither have I, but I’m pretty sure I came close to replicating the experience in that store yesterday. So this place that’s too cramped, too crowded, has long queues, closed checkouts, an unfamiliar layout and doesn’t stock half of what I’m looking for is also full-to-overflowing with couples flanked by two or more children. Couples! Two or more children! In a supermarket – together!? WTF!?! Frankly couples with more than one offspring should be banned from supermarkets. Surely one of the perks of coupledom is some Woolies-sponsored time out? One stays at home with the kids, the other attends to the mundane chore of the weekly shop – isn’t that how it goes? How did so many couples not get that memo? I really do quite like going to the supermarket, but there are any number of mundane chores that I don’t entirely dislike when I’m in the throes of doing them. That doesn’t mean I espouse their virtues as the ideal conduit for family togetherness! 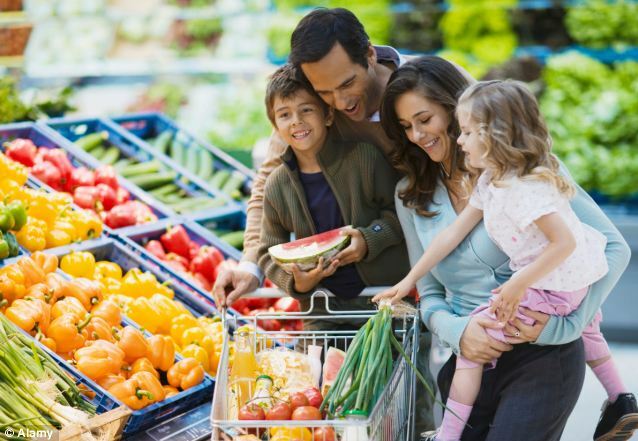 Are today’s parents so short on ideas that they have to make a family outing of doing the groceries? Or is it just each other they can’t bear to part from? It’s not exactly an intellectually or physically demanding task, so why the need to face the challenge together? Presenting a united front doesn’t make it easier, cheaper or any more enjoyable, particularly with an unruly litter of descendants in tow. 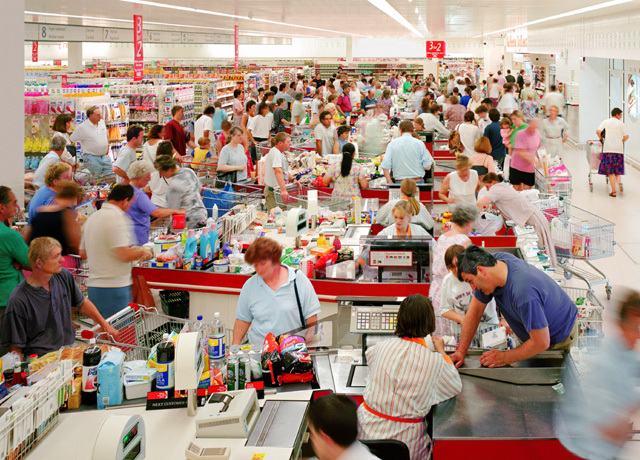 Incontrovertible Truth #1: no kid ever wants to be dragged around a supermarket. “C’mon kids, into the car, we’re going to the supermarket!” isn’t exactly music to kids’ ears. But get them inside one and it becomes an entirely different battle of wills, because Incontrovertible Truth #2 is that no kid ever wants a retail demand denied. Chocolates, chips, a drink, a toy or whatever other random object the kid couldn’t possibly know anything about but which they must have just because it’s there – once they’re inside that shop, all bets are off. For a couple to voluntarily introduce two or more offspring into such an environment is about as lose/lose as scenarios come. Well-practiced parents complain about the temptation supermarkets put in the way of greedy, snatchy little hands that always want everything they see. If a parent has no choice but to take their kids shopping with them, I sympathise with them up to a point. Conversely, sympathising with them also means I’d be tolerating their children and the level of available sympathy will rapidly diminish with each passing moan, wail and piercing scream – and that’s just the parent trying to keep the kids under control. Don’t even get me started on the noises the actual children make! There’s just no excuse for couples who have the option of not turning the weekly shop into a family excursion but do it anyway. So they don’t like temptation? Here’s an idea: don’t take the kids to the supermarket! That’s the very definition of a win/win solution – the parents win because their greedy, grabby little brats won’t throw temper tantrums when they don’t get what they want; and singles and other un-bred folk don’t have to tolerate the obnoxious behaviour of over-indulged children and their parents’ ineffectual responses to it. No, there’s no reason I can see for any couple with two or more children to ever be in the same supermarket at the same time with any of their progeny, unless by an extremely unfortunate coincidence. So anyway, just when I thought I was about to escape, the horror to end all horrors: why is it that self-serve checkouts are only ever used by people with no hint of technical sense, no experience in a retail point of sale role and/or who seem quite content to still be on exactly the same spot in exactly the same supermarket this time tomorrow? Young, old, in-between – age doesn’t appear to be a factor. It’s as if they’ve never been into a supermarket before or if they have, it’s as if they’ve never paid one iota of attention to what the person scanning their groceries was doing. 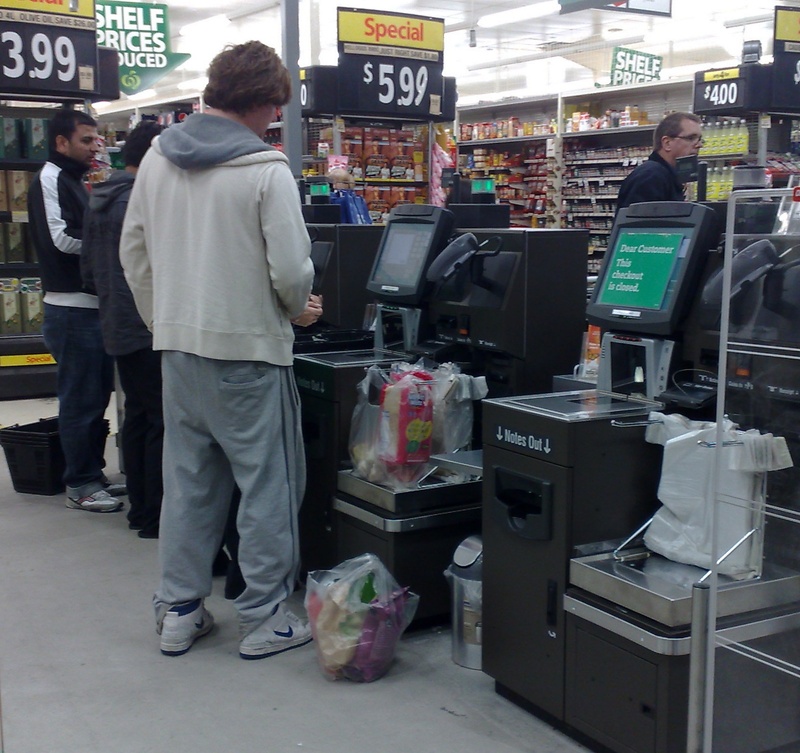 Yet despite this, now every single time they go shopping they think it’s a good idea to wheel their half trolley of groceries up to one of a limited number of self-serve checkouts and scan it all themselves. They can’t find the barcodes. They’ve got six of the same thing, but they can’t find the barcodes on any of them. They can’t get their head around the concept of placing one item in the bag before scanning the next one. They don’t actually know what the vegetable they’re holding is even called. They want to question a price. They put three things down at once, so the checkout goes into electronic apoplexy, its light starts flashing and its recorded voice tells them to wait for assistance – it’s like some personal affront, a slight on their ability. With their wounded pride and violated dignity, they stand there with a facial expression that says, “this is definitely the least-expected outcome of my day so far”. It really says something about society today, doesn’t it? When so many people would rather put themselves – and everyone in the queue behind them – through that amount of pain, just to avoid being served face-to-face by a fellow human who’s actually paid to do that job and who would, in all fairness, probably do it better and much faster, then there’s either something horribly wrong with the service staff in our supermarkets, or a significant chunk of supermarket customers are massively antisocial. I’m a ranty old man – what’s your excuse? This entry was tagged supermarket. Bookmark the permalink.